It is International Women’s Day on Wednesday and the City of Fremantle celebrates it with author Mihaela Nicolescu who will be sharing emotionally charged encounters into women living on the edge. It is on at the Fremantle Library from 6-7.30 pm on March 8. Hundreds of people turned up at the Fremantle Arts Centre on Wednesday evening for the announcement of the winner of the T.A.G. Hungerford Award for unpublished manuscripts, and to celebrate the 40th anniversary of Fremantle Press. The Hungerford Award is WA’s longest running and most prestigious award for unpublished work and today’s winner was Jay Martin for her work Learning Polish. Five authors were shortlisted, four women and one man, and although the judging is anonymous all five came from the Fremantle area. Fremantle Press started as the Fremantle Arts Centre Press so today’s celebrations were just in the perfect location. Reading has been one of the great pleasures of my life from childhood on and inspired me to travel and explore cultures I knew very little about. Go buy a book tomorrow! Fremantle author and Notre Dame University lecturer Leigh Straw is launching her latest book at the Orient Hotel today at 6.30. The Worst Woman in Sydney: The life and crimes of Kate Leigh is a fascinating book about one of Sydney’s leading crime figures in the 1900s. Kate Leigh was only 155 cm tall but a larger than life figure feared by many. Sydney newspapers would write about her often as she was involved in prostitution, drugs, sly grog etc. Hence she was considered by police as the worst woman in Sydney. There is also a Fremantle connection in the Kate Leigh story as she married Fremantle criminal Shiner Ryan in 1950, but because neither of them were willing to move to another state the marriage only lasted six months. Come and listen to Leigh Straw tonight when she tells more about her book. I hope her crime fiction books will also be available at the event organised by New Edition bookshop as one of them plays out in Fremantle with murders all over the West End. The City of Fremantle T.A.G. Hungerford Award is dedicated to recognising and nurturing emerging voices in Western Australian literature. It is a biennial award that celebrates literary merit and originality, and is given for a full-length manuscript of fiction or creative non-fiction by a Western Australian author previously unpublished in book form. Past winners have gone on to be recognised by the Miles Franklin Literary Award, the Man Booker Prize and the Orange Prize for Fiction, among many other national and international accolades. Western Australia’s longest running and most prestigious award for an unpublished manuscript offers a cash prize of $12,000 and a publishing contract with Fremantle Press. The winning author will be announced at a special event at Fremantle Arts Centre in November 2016. 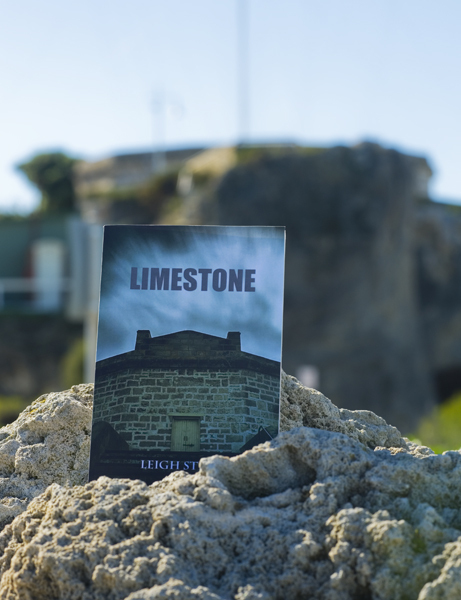 It’s not often we see a crime novel published that is set in Fremantle, so I was of course interested to find out about LIMESTONE by Leigh Straw. The story starts in Bar Orient in High Street and a murder in Mouat Street that turns out to be the third murder on women and the work of a possible serial killer. I won’t tell you more. Go buy the book! Dr Leigh Straw is a lecturer at Notre Dame University in Australian history and Aboriginal studies and the book cover is the Round House. The book reads well and there is a sense of belonging reading about all the local places, even when finding dead bodies of women in our town is not very uplifting. But it’s fiction and Freo is a relatively safe place still. 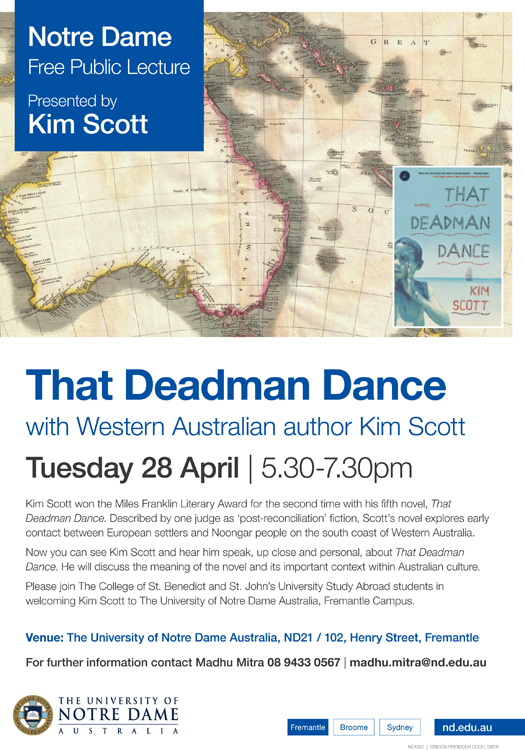 The University of Notre Dame will host multiple Miles Franklin Literary Award winning Indigenous author, Kim Scott, to its Fremantle Campus for a public lecture about the background and inspiration behind his novel, That Deadman Dance. The book explores the first contact between the Noongar people, European settlers and American whalers in a 19th century setting in the Great Southern Region of Western Australia. It follows the story of young Noongar man, Bobby Wabalanginy, and decisions that lay before him which could have potentially affected not only the lives of his ancestors, but also the lives of his new-found settler friends in Australia. That Deadman Dance won several awards in 2011, including the Miles Franklin Literary Award for the best Australian novel or play which portrays the beauty, challenges and characteristics of Australian life. It also collected the Premier’s Prize and the Best Fiction Book prize at the WA Premier’s Book Awards. RSVP: Please contact Madhu Mitra on +61 8 9433 0567 or email madhu.mitra@nd.edu.au.